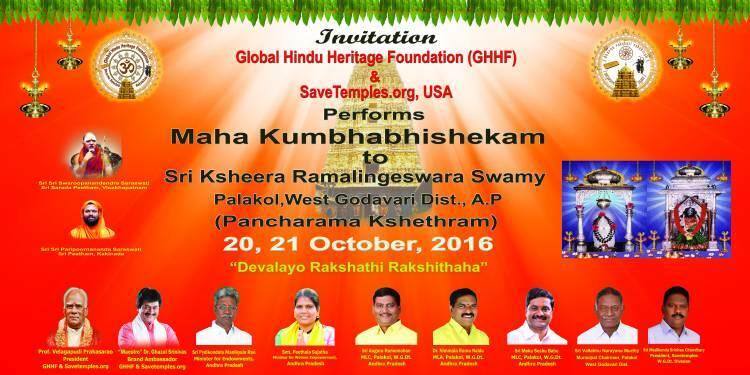 Global Hindu Heritage Foundation (GHHF) is very happy to organize and conduct Jeernodharana to Sri Ksheera Ramalingeswara Temple in Palakol in West Godavari District, Andhra Pradesh on October 20 and 21, 2016.The Agama Shastras have ordained the performance of a “punar-uddhaarana Kumbhabhishekam” of every temple once in twelve years. 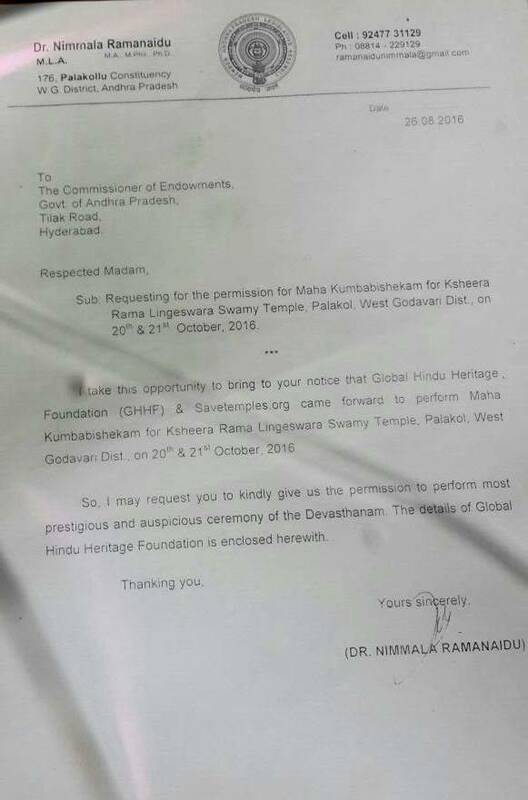 Realizing the need to revitalize and invigorate the Temple every 12 years as per Agama Shashtras, Dr. Ghazal Srinivas, Brand Ambassador of GHHF and SaveTemples organization, requested the Department of Endowments to grant permission to do Maha Kumbhabhishekam through Palakol MLA, Dr. Nimmala Ramanaidu. Permission to organize this event was granted to Dr. Ghazal Srinivas of GHHF and Savetemples.org. The letter is attached for your information. Joint Commissioner, Sri S S Chandrasekhar Azad personally went to Kanchi and sought the blessing of His Holiness Sri Jayendra Saraswathi of Shri Kanchi Kamakoti Peetham to perform the Jeernodharana Kumbabhishekam. All the arrangements are being made with the help of hundreds of volunteers to make this event a grand success. Palakol, being the home town of Dr. Ghazal Srinivas, is very much excited, enthused and heavily involved in performing this function to attract lakhs of people around the village. His Holiness Sri Swaroopanandendra Saraswathi of Sri Sharada Peetham of Vishakhapatnam and His Holiness Sri Paripoornananda Saraswathi of Sreepeetham of Kakinada will participate in the Kumbabhishekam and bless the people who would be attending the function. Such notable dignities as Sri Paidikondala Manikyala Rao, the Minister for the Department of Endowments, Smt. Peethala Sujatha, Minister for Women Empowerment, Sri Angara Ramamohan, MLC of Palakol, Dr. Nimmala Ramanaidu, MLA of Palakol, Sri Meka Seshu Babu, MLC of Palakol, Sri Vallabhu Narayana Murthy, Municipal Chairman of Palakol, Sri Medikonda Srinivas Chowdhary, president of SaveTemples of West Godavari District and host of others are invited to attend and witness this historic spiritual and religious event dear to all Hindus. 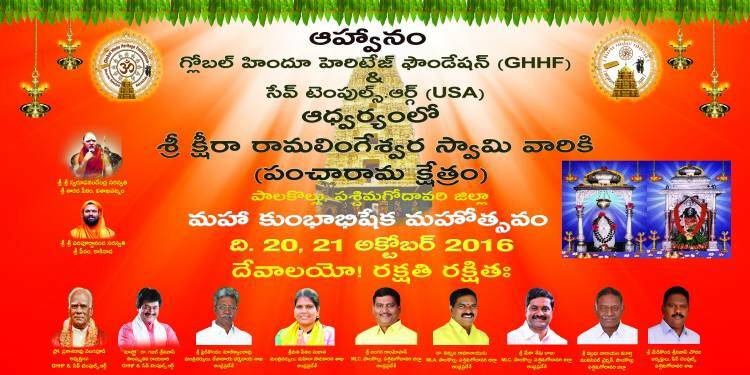 Kumbhabhishekam will be performed by Dr. Ghazal Srinivas and Surekha Couple. Kumbabhishekam is required to be performed to all the presiding deities in a temple complex. 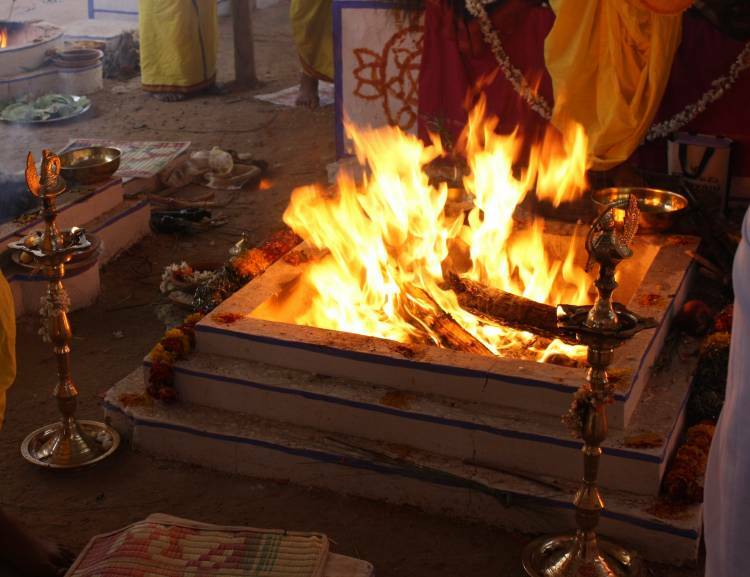 Through the elaborate chain of Yagnas (fire sacrifices) that generate power and energy that is used to infused powers (Sannidhyam) in order to restore, recharge and revitalize the idols at the appropriate Muhurtham (time) on an auspicious day. It is believed that over a period of twelve years the originally infused powers in the murthies will tend to diminish due to unintended consequences of the actions of the devotees and priests. Through the redress of genuine difficulties and grievances of the discerning and deserving devotees, the inherent and infused spiritual powers of the installed idols are diminished over a period of time. It is possible that some of the devotees may not be observing the purity that is needed to maintain sacredness in the Temple affecting the energy level in the Temple. Similarly, unintended deficiencies (apacharaas) the priests may incur while conducting of Poojas, prayers, Homas, chanting mantras, aaraadhanaas and host of other factors may have negative effect on the installed deities. Consequently, there is a need for rejuvenation or restoration of the deities. Through Kumbhabhishekam, these deities are revitalized. It is also believed that at some of the Dravidian Temples, the Kumbhasa (Kalasas at the top of Rajagopuram) are filled with certain grains which act as lightning conductor. Over the years, these grains decompose and lose their ability to conduct electricity over a period of time (Jeernam in Sanskrit means digest/decompose). During this ceremony, these grains are replaced with fresh ones. Additionally, frequent repairs, structural changes, paintings and other necessary changes in the temple also affect the power and energy level. Through Jeernodharana, sanctified water is used to do Abhishekam to the deities and sprinkle on an auspicious moment. 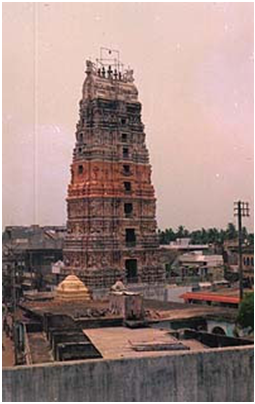 Sri Ksheera Ramalingeswara Swamy Temple is one of the five temples dedicated to Lord Shiva. 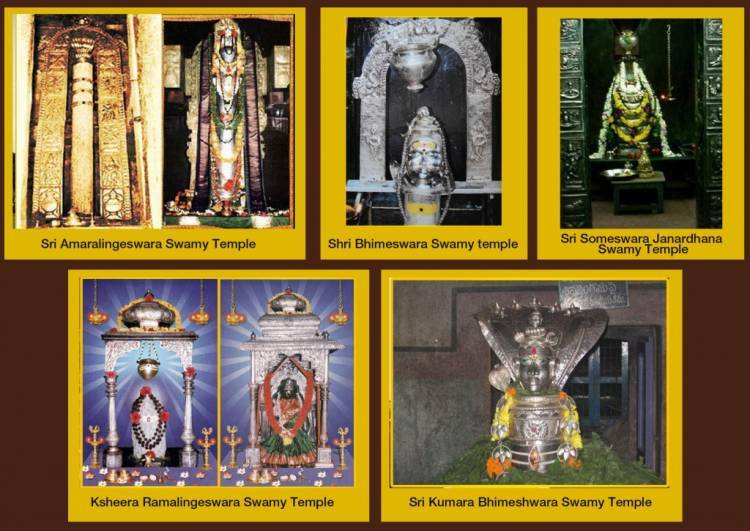 These five Shiva Temples are known as Pancharama Kshetras. 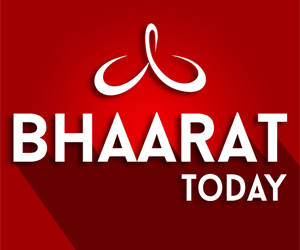 These places are distributed over three districts, East Godavari, West Godavari and Guntur of Andhra Pradesh in India. All Hindus consider visiting these temples as very sacred. Pancha means five and Aarama is peace. So Pancharama means five pleasant and peaceful places. According to one of the stories, Tharakasura, the grandson of Hiranya Kashipu, Tharakasura worships Lord Shiva and gets his Atma Linga with a promise that he can killed only by a boy. With that blessing, Tharakasura starts troubling people and Devatas. 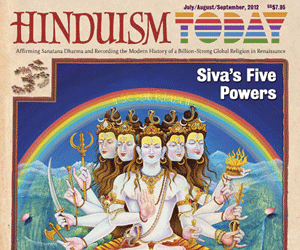 Devatas go to Lord Shiva to find solution to punish Tharakasura. Thus, Lord Kumara Swamy Avatar happens and boy kills Tharakasura. Following the death of Tharakasura, the Athmalinga gets divided into five. Each one gets installed by Devatas in five different places. These places are called Pancharama Kshetras. It is located in Palakol also known as Ksheeraramam located near Narasapuram in the West Godavari belt of Andhra Pradesh. 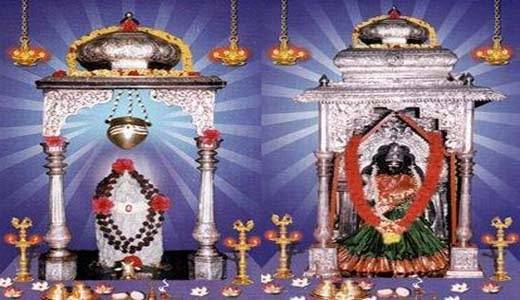 It is considered to be one of the five Pancharama Shiva shrines of Andhra Pradesh. The five Pancharama temples are Draksharama, Kumararama, Ksheerarama and Bheemarama and Amararama. Legend has it that Upamanyu, the son of Kaushik Muni requested Shiva that he be granted the desired quantity of milk for the performance of his daily rituals and that Shiva caused the Ksheera Pushkarini tank to overflow with milk from the mythical Ksheera Saagaram (the milky ocean). Hence the names Paalakollu, Dugdapovanam and Ksheeraramam. It is believed that Shiva was worshiped by Rama at this shrine as in Rameswaram. The white marble Shivalinga worshiped in the sanctum is referred to as Ramalingeswara Swami as well as Ksheera Rameswaraswamy. Built during the 10th-llth centuries A.D. by the Chalukyas, it represents the south Indian style and has a 9-storey Rajagopuram that soars 125 feet, one of the tallest in Andhra Pradesh. Colorful images and sculptures of various deities are engraved on the walls and can also be seen inside the temple complex. We extend invitation to all of you to attend this sacred Maha Kumbhabhishekam function to rejuvenate and reinvigorate the Temple on October 22nd and 23rd. Invitation is attached with the necessary information. If you would like to contribute to the performance of Kumbabhishekam to Sri Ksheera Ramalingeswara Temple on October 20 and 21st, please send tour tax deductible contribution. Check Payable to: GHHF; and mail it to: 14726 Harmony Lane, Frisco, TX 75035. Send Names: Please also send the names of your family members along with Gotra and Nakshatras for each family member to do sankalpa at the function. Deadline to send donation: October 18.